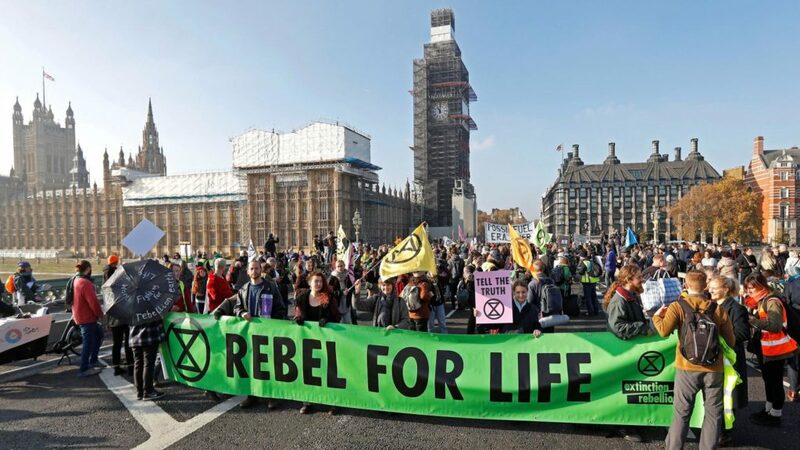 Extinction Rebellion is a campaign by the Rising Up network, that promotes a fundamental change of the UK’s political and economic system to one which maximises well-being and minimises harm. The mission of ER is: “to spark and sustain a spirit of creative rebellion, which will enable much needed changes in our political, economic and social landscape. We endeavour to mobilise and train organisers to skillfully open up space, so that communities can develop the tools they need to address Britain’s deeply rooted problems. We work to transform our society into one that is compassionate, inclusive, sustainable, equitable and connected”. 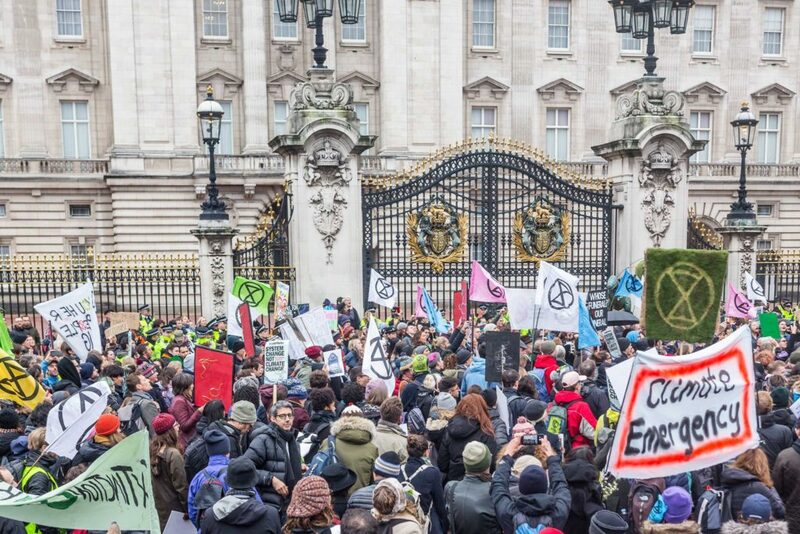 The ER campaign has in a very short amount of time managed to capture the public imagination and numerous spin-off Extinction Rebellion events and sister protests are taking place across the globe as well as local chapters, interest groups and community organising affiliates. 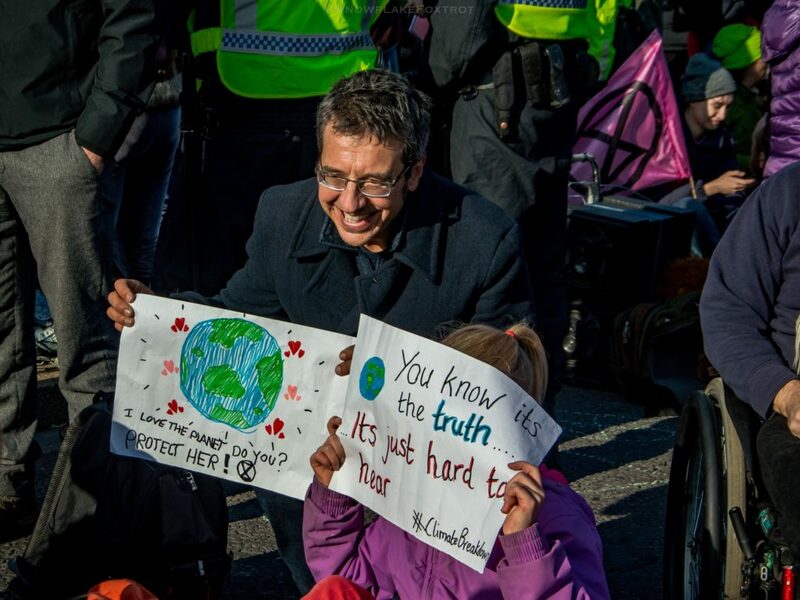 Moreover, 100 academics, authors, politicians and campaigners, became official signatories and endorsers of the movement calling for immediate action to address climate change. 1. 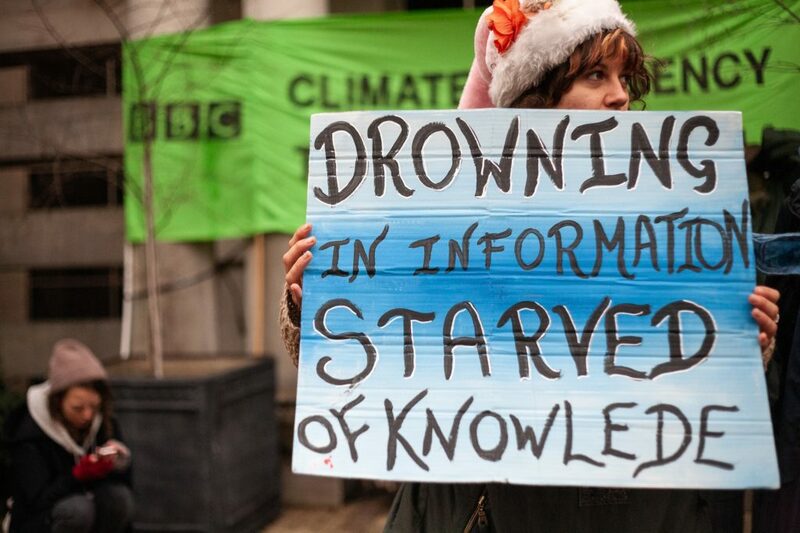 Give people the scientific facts on climate change. 2. Inform people that change is still possible, though the window of opportunity is short. Alert them to the absolute emergency of the situation. Be clear that their children, grandchildren, niece, nephew, most of life on earth, are likely to inherit an unlivable planet. There is an existential threat – use credible sources. 3. Ask people to act according to their values – it is a universal value to protect life and to act in service in an emergency situation. 4. Share that grief is a necessary part of this process – encourage grieving, it frees the heart to love more deeply and we need love in action. 5. Share that civil disobedience as a way to create drama and then political will, it is a tried and tested mechanism. Offer inspiring examples. 6. Ask people if they are willing to get arrested in peaceful civil disobedience, ask if they are willing to risk jail time. 7. Run a follow up non violent direct action training and support affinity group formation. 8. Provide dates for actions way in advance so people can plan. 9. Create a distributed organising model based in “momentum” organising and holocracy (training from the Ayni institute / Carlos Saavedra). This is basically a hybrid of mass protest and structure based organising. Much of this is explained in the book “This is an Uprising”. 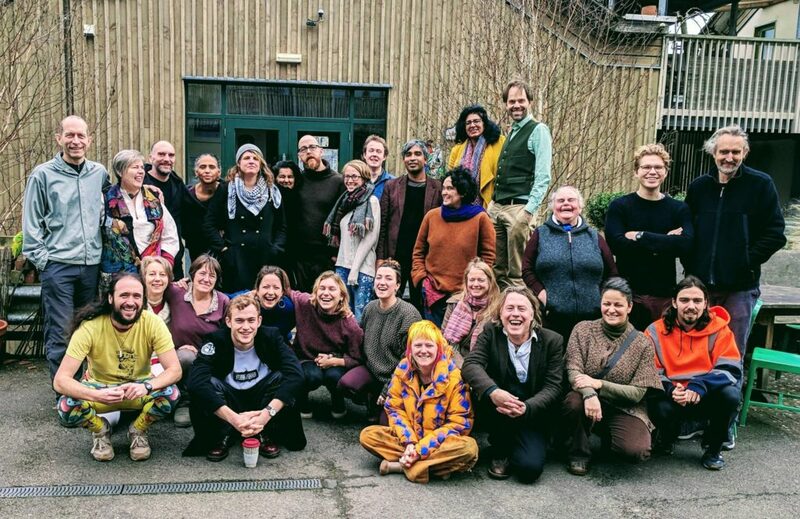 Extinction Rebellion fam smiling and plotting revolution in In Stroud, Gloucestershire. 10. They Declared a Rebellion against the British Government on Oct 31st at Parliament, accompanied by a water protection ceremony and a civil disobedience leading to arrests. (Nov 12th saw a fortnight of civil disobedience and jail time). 11. They are working with Mission Life Force to run the defense of Conscientious Protection- they have become legal trustees of the Earth (through a legal trust document- linked to raising funds to being about international ecocide law at the Rome Statute level). 12. They will organise regional coordinators and train the trainer mechanisms. This is already in place for running the talks- about 40 to date. They have had 50-60 people come to some talks. Some want to go home and numb of course- the bystander effect, but it also triggers the upstander effect– the desire to not only act, but to do what it takes. 13. Many have been waiting for this moment, with regular feedback this is the most exciting thing happening in the UK political scene right now. This is different, energy is gathering, people are hungry to do something together. People are coming out of retirement. Younger ones are joining with excitement. 14. Deep collaboration is beginning, this involves liberating ourselves from the narcissistic bonds of our current culture, into a a service orientation, being willing to sacrifice some of our comforts to honor and protect what we love. It truly feels like a shift in consciousness. 15. They believe we are all, to an extent acting under some kind of herding effect. When enough of us break free from that and run in the opposite direction, others will join. They know we need (Erica Chenoweth data) up to 3.5% of the population to join in in order to achieve social change. This is only 2 million people needed in active participation (including support roles- not just arrestees). Also, check out Chenoweth’s TED talk. Extinction Rebellion has these 10 principles and values embedded in a decentralised organising structure. They are avid readers and really have done their research on how things change (ER cofounder, Dr. Gail Bradbrook delineates some of this thinking here). Creating a world that is fit for the next 7 generations to live in. Mobilising 3.5% of the population to achieve system change – such as “Momentum-driven organising” to achieve this. Creating a culture which is healthy, resilient and adaptable. Leaving our comfort zones to take action for change. Following a cycle of action, reflection, learning, and planning for more action. Learn from other movements/contexts as well as our own. Working actively to create safer and more accessible spaces. We live in a toxic system, but no one individual is to blame. Using nonviolent strategy and tactics as the most effective way to bring about change. We collectively create the structures we need to challenge power. Anyone who follows these core principles and values can take action in the name of RisingUp! Most of the ER work is conducted via their parent organisation and fiscal sponsor, Rising Up! All Rising Up members are volunteers. Currently there are 15 in the core team, about 60 regular volunteer organisers, a wider network of about 500 participants, 2500 people on our database and over 5000 interested online. Many of the members have reorganised their lives and finances so that they can do this work. They have established a compensatory budget so people can get money when they need it to pay bills. This is not about NGO style salaries but also not trying to run a revolution on thin air. Some of our funding will go towards some of these compensations. 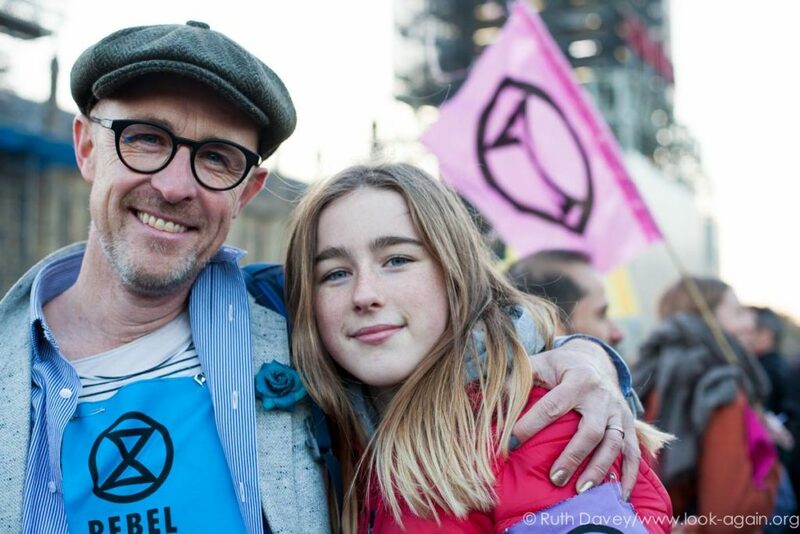 #humansofxr “We’re here to make a difference – things have to change and fast!” – Jamie, 43, life coach, with daughter Ruby, 13, student. 2. Non Violent Direct Action Trainings as follow up to key actions. 3. An integration pathway so people are in local affinity groups or supporting their various working groups nationally. 4. Developing and delivering an effective communications plan. 5. Developing and delivering a plan of peaceful civil disobedience events -including a Declaration of Rebellion- they are declaring themselves in a state of rebellion against the government because they are not taking sufficient actions to prevent and protect us from abrupt climate change and ecological destruction (all other means including legal ones have been exhausted). 6. Ensuring people understand and are as best supported as possible throughout the process of arrest. 7. Escalation of actions which includes possible jail time for some members. 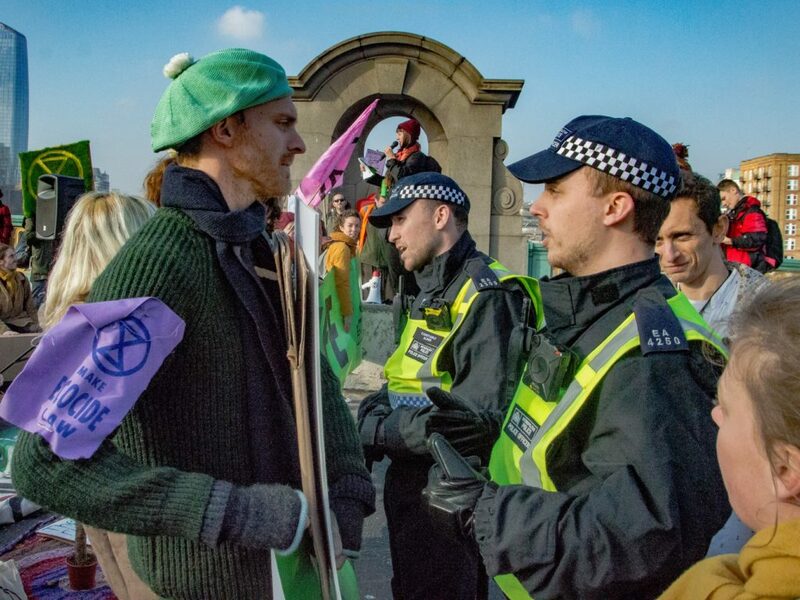 “An unjust law is no law at all.” An unknown Conscientious Protector moments before being arrested on Southwark Bridge, Rebellion Day. Image by @Snowflake Foxtrot.